Guests socialized and bid in the hangar with the doors to the runway opened behind them. One of the articles in the August 2009 issue of Small Market Meetings was “Planes, Trains, and Automobiles: Transportation Museums are on a Roll.” The article discussed the many types of events held in transportation museums. 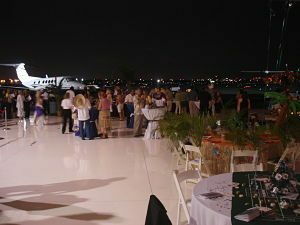 I haven’t conducted any galas in a transportation museum yet, but I do have experience conducting galas in unusual fundraising auction venues, like an executive airplane hangar. In this podcast, learn a bit about what you’ll want to consider when you’re thinking about auction venues.